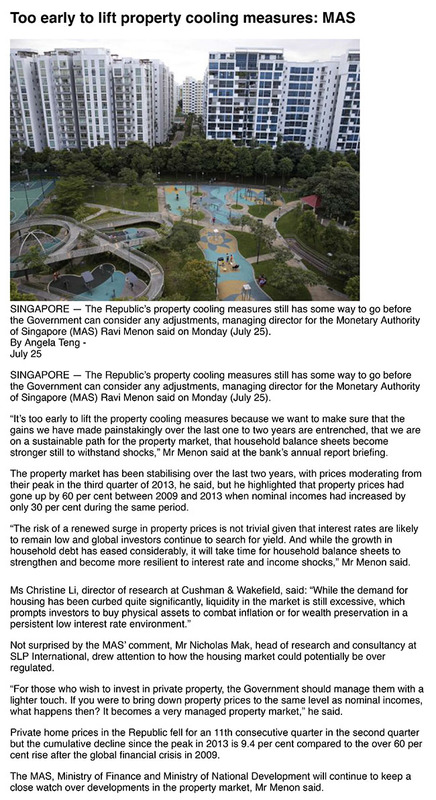 The property market is adjusting in the right direction but it is too early to ease the cooling measures, the Monetary Authority of Singapore (MAS) said on Monday (July 25). Private home prices in the Republic fell for an 11th consecutive quarter in the second quarter but the cumulative decline since the peak in 2013 is 9.4 per cent compared to the over 60 per cent rise after the global financial crisis in 2009. Developers’ private home sales halved in June from May this year.